I sat down tonight with so many ideas and thoughts flowing through my head it was hard to put into words exactly what I wanted to say. It is a hard thing to do when you feel the weight of past and future generations upon you. You don’t want to disappoint those that have walked on or those that are to come. After the last city council meeting I was disconcerted, but not shocked, to hear claims from council members that #idpOKC speakers had a chip on their shoulders and that we were holding onto the past. I want to make clear that while I have no chip on my shoulder I do hold on to the past as the past that happened is not only not acknowledged but is celebrated by way of Columbus Day. So I am going to show you a picture and I am going to ask you politely not to look away. Really look at that picture and imagine a child being cuffed and dragged away from everything they have ever known. 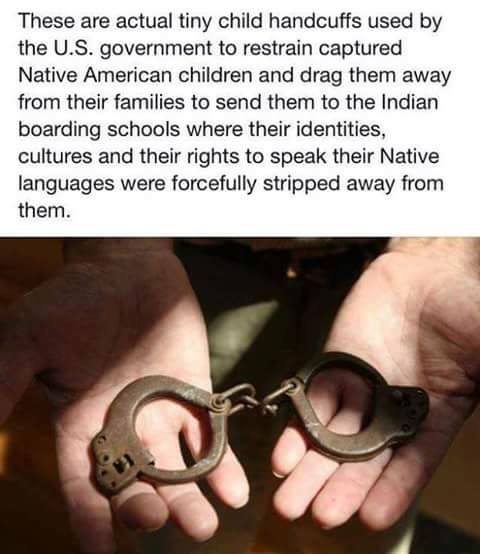 This happened to many Native children as part of the attempt at assimilation. This happened because Columbus “discovered” America. This is the shared history that you and I have. It is sad and dark and shameful. I do not show you this photo to shame you, any more than I want Indigenous Peoples’ Day to be divisive, as some city council members have intimated. I am showing you this photo because this is the shared history of our nation; the history that is glossed over, that is hidden. You see, when you have to hide a history like that it also means you have to pretend the people it happened to are also in the past, even if they aren’t. Asking for an Indigenous Peoples’ Day is not about holding on to the past. It is about preserving the many varied and beautiful indigenous cultures of today. It means working every day to ensure that not a single sacred thing is lost, knowing that some are irretrievable. It is trying to speak and be heard, to let others know that our shameful shared history no longer has to define us. It is raising our voices in social media posts and in city council meetings and yelling that we are still here and that we still matter. It is about asking for the simplest of things: a day where we can celebrate a new shared history, one that will amplify indigenous cultures and bring a new understanding in cultural exchange, all while starting on the road to healing ancestral wounds. I don’t want to give yet another primer on Columbus and his horrid treatment of the Taino. I don’t want to mention the fact that we are celebrating a man who not only has his own day in Italy (Giornata nazionale di Cristoforo Colombo) but never even came close to landing in the United States. I don’t want address the fact that most Columbus Day celebrations happen at the mall, where you get 20-50% off merchandise. What I want, what Indigenous People want, is the recognition that perhaps that altered history isn’t a thing to be celebrated, whether via parade or a discount at Macy’s; that there can be something better. That there should be something better. It is time to put this shared history to bed, to acknowledge it, to learn from it, and to grow. By supporting Indigenous Peoples’ Day you stand united with the many who have had no voices for so long and are now saying that together we can celebrate cultures that have endured and flourished. By standing with us you are saying that, though we may be small in number, what indigenous people bring to the table in Oklahoma through tourism, cultural events, athletics, and the arts and sciences deserves more than a cursory glance of pow wow culture at Red Earth or an Indian taco at the state fair. Supporting Indigenous Peoples’ Day is saying while we cannot resolve the pain of the past we can honor the spirit of hope going forward, together, and create a new history that will make us both proud. Tagged Columbus Day, Cristoforo Colombo, Italy Giornata, Red Earth, Supporting Indigenous Peoples Day, United States. Bookmark the permalink.